John Takes Pop-Culture: Happy Easter! Happy Easter everybody! I'm on Easter vacation, so I'm going to make you do all the work! I always did like this one... I wonder why? I look forward to hearing what you have to say in the comments. Look for my thoughts next Monday! 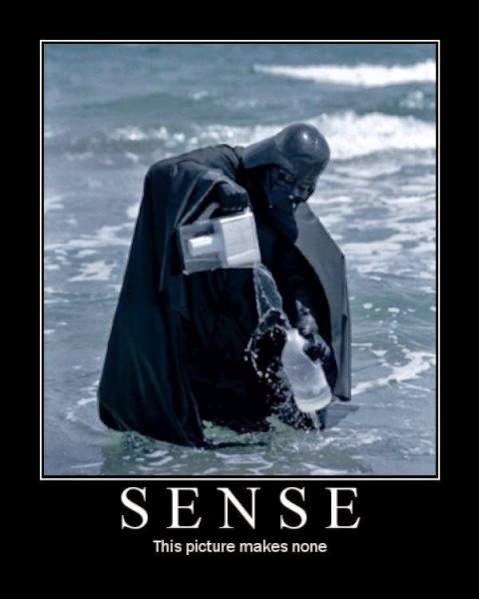 The water is too salty and dirty for darth vader to drink safely and so he is filtering it to quench his thirst. This picture is a stab at the heart. It symbolizes the hardships endured by Darth Vader, which we do not consider as we rightly demonize him. When Han Solo poked his nose into the battle for the Death Star, he sent Vader tumbling into interstellar space in a one-man, short-range fighter. The sheer struggle for survival must have been crushing. This near hopeless struggle, which the film does not show us, is suggested by Vader’s plight in the photo: surrounded by vast stretches of sea water, which he is unable to drink, he struggles with a small sample of the high-technology on which he usually relies to make potable water, which he is still hard pressed to use because of his prosthetic face. Oh the humanity! But, the caption remains correct, because it is senseless to consider such things in regard to a mass-murdering megalomaniacal tyrant who has not repented and will continue to kill, if his struggle to survive succeeds. Pathos wasted! The picture, after this loop-the-loop of poetical invocation, is senseless. Darth Vader's next insidious plan is to bankrupt Earth's bottled water industry by branding his own "Darth Water" which he purifies from the ocean itself!